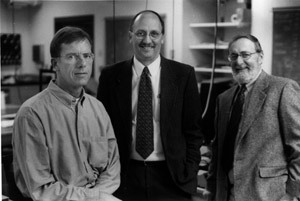 The Center for Neurodynamics was founded in 1996 by Frank Moss (r), Lon Wilkens (l) and Steve Lehmkuhle (center). Initial studies focused on the role of noise and nonlinear dynamics in biological systems, leading to the first demonstration of behavioral stochastic resonance in a living animal, the paddlefish. The Center, which has been funded by grants from the Office of Naval Research, the National Institutes of Health, DARPA, and the National Science Foundation, has branched out into many areas of complex dynamics in biological systems, ranging from the complex neuroanatomy of the paddlefish, to synchronization in the crayfish mechanoreceptor-photoreceptor system, to the role of noise in human sensory perception, to the complex behavior of swarming zooplankton. Joining the Center as faculty in 2004, Sonya Bahar added the spatiotemporal imaging of neural systems was added to the Center's roster of projects. Her group is imaging the changes in neural synchronization that accompany seizure activity in the neocortex. She succeeded Frank Moss as Center Director in 2006. Her projects for the next decade include computational studies of the role of mutation rate in speciation, and exploration of other computational models of evolutionary dynamics. In recent years, the Center has expanded to include virtually all UMSL faculty with research interests involving the neurosciences. Check back for more updates on Center activities, including our informal colloquium series.